Rhys is a native of North Carolina, where her best memories were formed on trips to the mountains. She received a chemistry degree from Warren Wilson College, but perhaps took more pride in serving as the shepherd on the school farm. 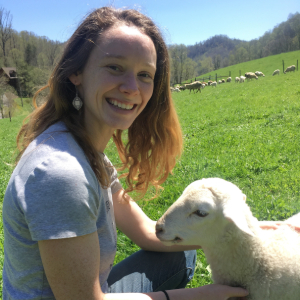 In that position she learned to enjoy working outside and carried her passion for food by working on several small farms in Western North Carolina and out west. Rhys is now thrilled to discover even more of this region while serving as MountainTrue’s Forest Keeper Coordinator. In this role she works to improve public lands through education, volunteer engagement and direct treatment. In her free time Rhys loves cooking, road tripping, social dancing and hanging out with farm animals.